it was cold out. and the bitterly cold air allowed me to refocus my energies on the unfortuante incident that was tonight's game. 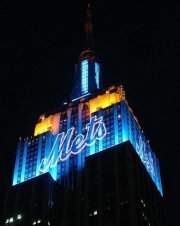 In retrospect I think that this evening's game was a wake up call to the mets. this will not be a cakewalk! as much as people (myself included) though oh, those cardinals are just going to roll over and die. they won't! they too want to make it to the world series and they'll fight tooth and nail to get there. 2. not taking pitches. It seemed to me the mets did an ok job taking pitches from carpenter early, but after that it was like lets hack at every first pitch to catch our flight to st louis. the inability of the mets hitters to work deep counts, whilst the cardinals did (eckisten etc) hurt the mets. 3. bullpen- games like this happen, yes the mets are 79-4 while leading after 7, but teams have bad games. I wasn't too happy about burning the bullpen, but i can't blame willie, he wanted to go for teh W and i respet that. 4 Blue- it sure seemed that once again the umpire's strike zone was very inconsistant, i hope for the sake of both teams that tomorrow night's zone is a little more consistent. 1. Reyes- the monster is out of the cage, 3 hits is a very good sign and i hope he can do the same tomorrow. the energy he brings to the game is simply amazing to watch (even on a tv screen 640 miles from shea). 2. Deglado- the man is a machine. Im bummed his great effort was put to waste, but i'm glad to see that he's still tearing teh cover off the ball. 3. We got to Chris Carpenter. if the mets can put a 4 spot up against the cardinals only good starter I can only wonder what they can do against jeff suppan. 1. work the count, i mean its jeff frickin suppan, and the cards bullpen isn't all peaches either, if they can get to it early they should be able to put up a knockout punch. 3. get 6 innings from trax. that's all i'm asking for. In summary: Over? Did you say "over"? Nothing is over until we decide it is! Was it over when the Germans bombed Pearl Harbor? Hell no! the tough get goin'! Who's with me? Let's go! The Mets will overcome this defeat. They've done it all season and they will do it again over the weekend. Sheaman will lead them to the promise land. Before this game I thought the Cards were a cute team. They've got Pujols. I like Pujols. They've got Carpenter. I like Carpenter. They've got Rolen. I like Rolen. They're a neat little story- avoided one of the biggest collaspes in history and sent the Padres home in the NLDS. Nothing that happened in Game 1 changed my mind. They threw Jeff Weaver at us! And hey, he pitched his little West coast heart out. But it certainly wasn't enough. Now I have nothing but distain for this team. It began with Pujols' comments after the game. Now anything he does makes me angry. After this game, I'm gotta hear about how great LaRussa is. Starting Spezio. Subbing in Taguchi. Playing Rolen at 3rd in the 9th. I gotta hear about how clutch this scrub Scott Spezio (with his stupid dyed soul patch) is. I gotta hear how Pujols broke out. I gotta hear about the Cards bullpen outpitching the Mets bullpen. 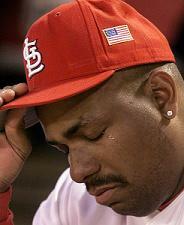 And, I gotta hear about the Cardinals actually having a chance in the series! I just hope the Mets are too. i'm hoping the mets took the cards best shot tonight. and they come out tomorrow swinging. The problem is that it puts me in a position to have to root for Steve Trachsel. great post. that is all. 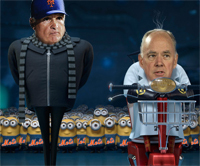 In retrospect I think that this evening's game was a wake up call to the mets. I find game 2 of the NLCS very similar to game 2 of the regular season. That game looked pretty easy and then Wagner went and blew it. It seemed to me like that game brought the team together more and from then on it was if one person failed, someone would pick them up. After that game, the Mets reeled off 7 straight wins. Yeah, that number sounds good right about now. went to bed last night feeling sick feeling the season was a loss. woke up to a beautiful morning took a nice long run and realized this is not over yet. now i just have to wait another 7+ hours until game time. The hardest part for me is waiting after a loss. Now I know why I'm not a football fan. It's mid-October already, I don't what I'd so if my team only had 1 or no wins at this point.